Small creatures, plus time equals a big mess. A friend of mine was given a pickup truck that had been sitting idle for a long time. It was a sort of “If you can clean it out, it’s yours.” type of deal. I had nightmares the night she told me of the horrors she found inside. Nightmares involving hundreds of mice skeletons, tiny spaces and a car wash vacuum cleaner. Quick Biff! 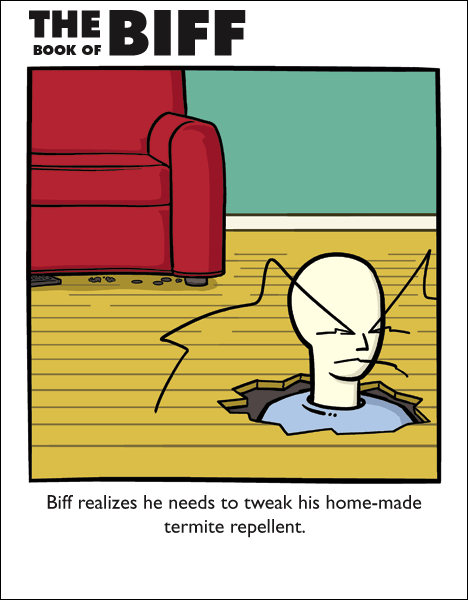 Use the remote under the couch to turn on the anti-termite defence system! Hmm. This one isn’t that funny, actually. First time poster, long time reader, hello to all! love the comics, never got around to posting. my termites know me by first name, so we get along pretty well. I tried to do the survey but it doesn’t work in Google Chrome. I thought Biff had put on a few pounds. Invention week, or maybe crazy machines week. I remember living in a wooded area. Our mailbox was always filled with spiders, and the remains of spiders. When we opened our Christmas decorations box that year, we found a huge, mummified huntsman spider, and a couple of mouse bones. We threw it all out before we could see if there was anything alive in there. I love all the little details, like the remote and assorted debris under the couch. If law HR669 gets passed, won’t that truck become illegal to own? on closer inspection, it is a remote, but biff could have lost that VHS again! I once had a volunteer job cleaning old historical houses. We had to do a basement with strange spider shaped clumps of mold…. The theme is wood. His cell phone looked like it was made out of wood. Biff should get some carpets down, then at least he’d have a few moments to sort of sag through the floor. @DTanza: How can you tell? @DTanza: No, that’s the face Biff wears for every occasion. Is it just me, or is Biff’s forehead massive? how deep is the space under Biff’s floorboards? Hmm, i heard once that you could get plague from trucks like that.